Family members plant flowers, trim grass, pull a few weeds, decorate graves of loved ones. One time Mary and I scrubbed lichen off the granite with our toothbrushes. I saw a watering can hang from a spigot, a metal pipe in the ground. Boy Scouts place American flags by white stone veterans’ graves. I remember when Bill played taps and as the clear notes sounded, the wind kicked up, blew swirls of dust and leaves, the sky got dark. And we all felt a shivering chill. 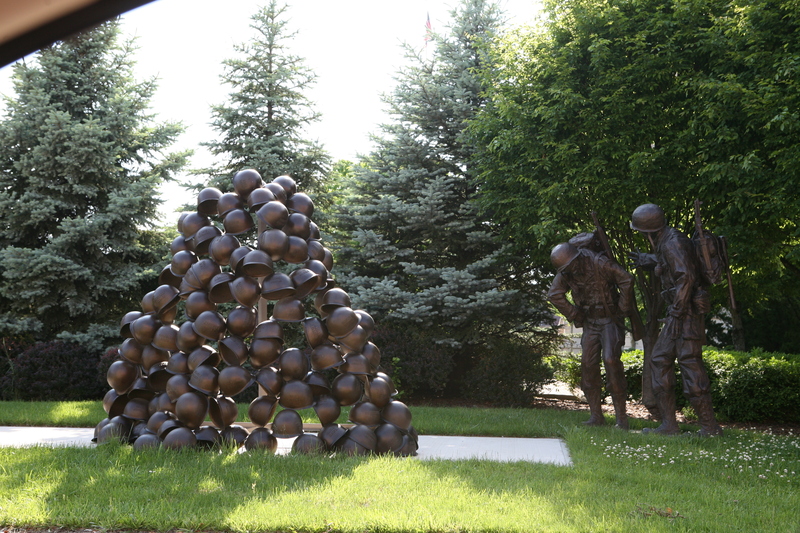 Each helmet bears a soldier’s name. 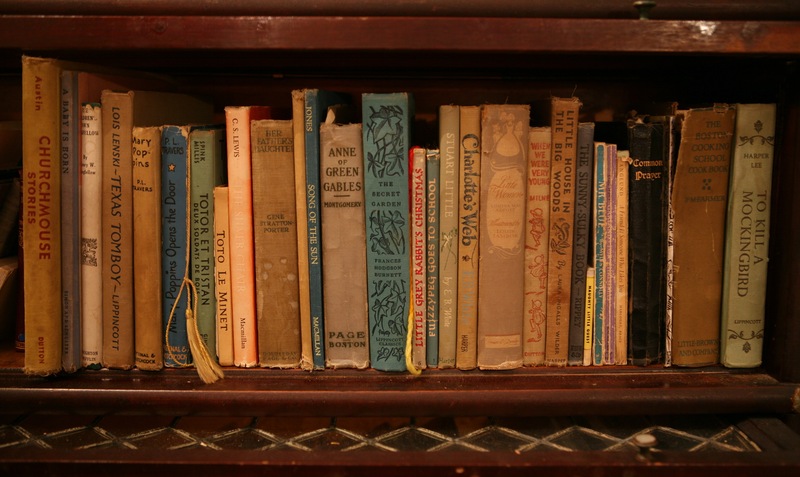 What books would you put on your favorites bookshelf? What books would you select for your bookshelf to be painted by artist Jane Mount? Her Ideal Bookshelf paintings (click link to see) featured in the New Yorker last August 11 inspired me to put twenty volumes together on one shelf and photograph them. Anne of Green Gables was a Christmas 1925 gift to my mother from her mother and the Gene Stratton-Porter book was my mother’s. C.S. Lewis’ Silver Chair is a stand-in for The Lion the Witch and the Wardrobe. Most of these books belonged to my sister Mary and got passed down to me. Longfellow was a gift to my brother David and me from Cousin Paul in 1961. In sixth grade I had to memorize, “Under a spreading chestnut tree the village smithy stands….. The Beatrix Potter in French was from my sister (who signed it Marie) and presented it to me on my half birthday one January fourth. The Tiny Golden Book in The Naughty Little Guest by Dorothy Kunhardt. The Sunny Sulky Book opened two different directions with the good children and bad children stories. I loved Fairy Eat-It-All who came in the night with a spoon for a little boy whose eyes were bigger than his stomach, and he had to eat his way through a mound of food he had taken and not eaten. So here are my books from growing up, all on one shelf. Society will evolve without me? is an e-reader not musty books. I like the feel of them in my hand. Turn them over, slip off a dustjacket. See the author peer back at me. The opening of the first page. Or a slender bookmark to hold my place. I’m sad they’re closing the store. reason number one. Two and three. the escape I mentioned before. Different regions prefer certain pastries, baked goods. 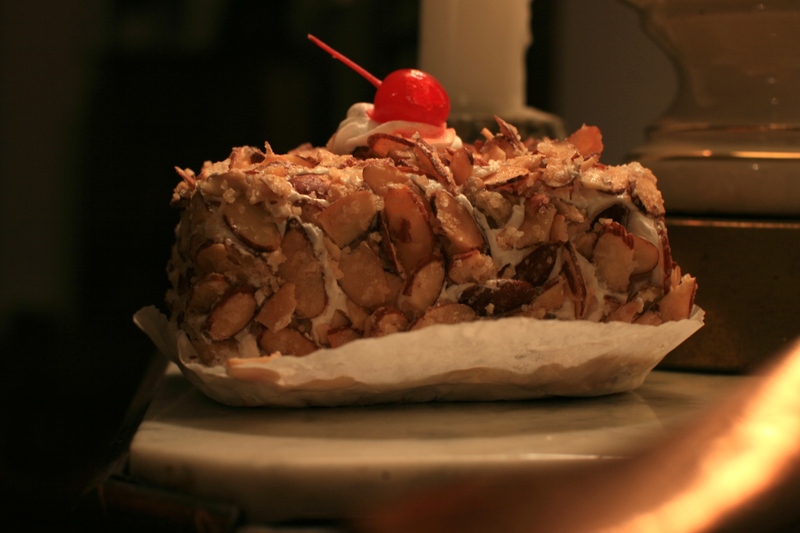 Burnt Almond Torte is popular in Pittsburgh. I’ve seen it as a wedding cake. tiered! Who brought the recipe here I don’t know but many Pittsburghers LOVE it. I’d never tasted one until we moved here. This one is from the Oakmont Bakery. Joan brought it to dinner one night. We split it three ways. Don’t know who ate the cherry. Not me. But before we devoured it, I photographed it. Here is a link to the Recipezaar Copycat Prantl’s Burnt Almond Torte recipe in case you want to have a taste of Pittsburgh Pastry/Dessert. I hear there’s one where chocolate is involved. You get behind a garbage truck on a narrow street. 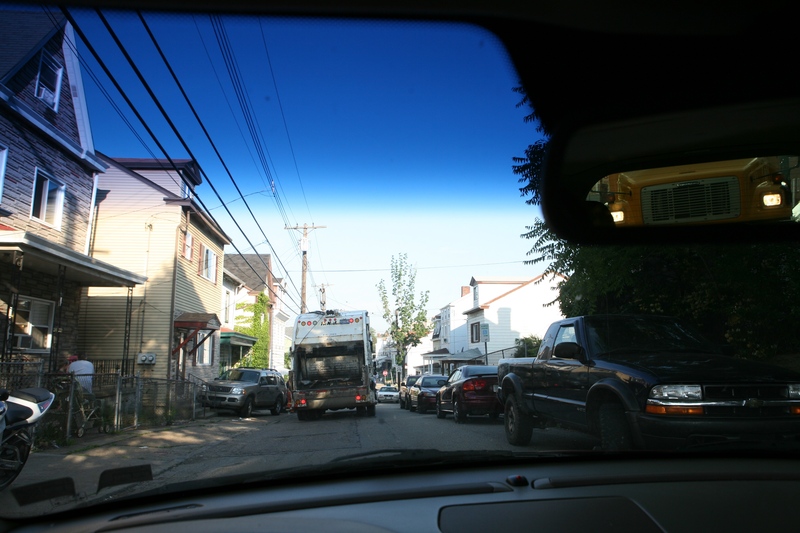 A school bus bears down on your tail, headlights reflected in your rearview mirror. The minutes tick tick tick. You watch the men pitch the bags into the back. Both sides of the street. You should have left home earlier, not stopped for coffee, gone a different route. You make it in time. But you might as well relax and take out your camera and shoot because there is no getting by. Just relax and photograph the scene where you are trapped. Wednesday nights I drive to the Northside and take a Video Portrait Class until nine. When I left to call a friend about previewing a copy of the movie I was burning I looked out and saw the sun setting on the courtyard fountain. Manchester Craftsmen’s Guild is a beautiful facility to take a class, hear a jazz concert, view student artworks. As I head to class I am so tired from school but after a short time I am thinking creatively of a dozen more projects to consider making. 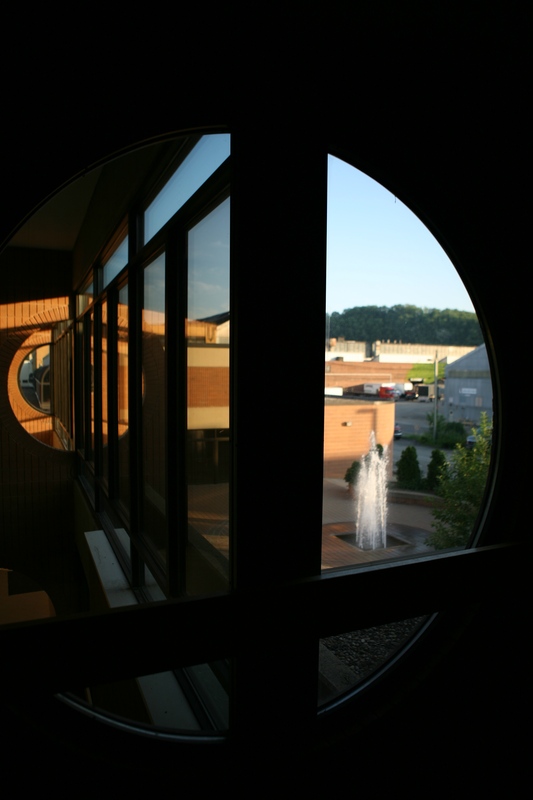 Classic photography assignment- photograph frame something as you shoot it! Classrooms at school are about 100 degrees. MCG is air conditioned! 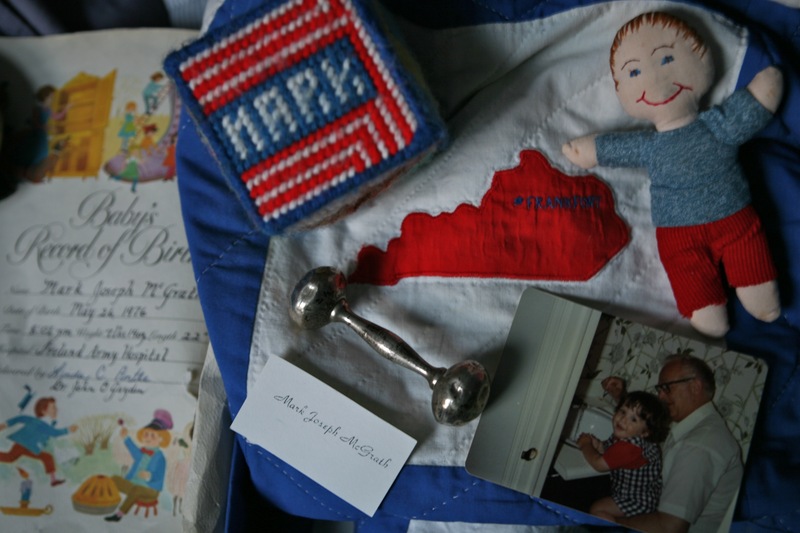 Stuff I have saved (and could find) makes a personalized birthday collage. Bigos is the Polish National Dish. Another slideshow seems a bit much but you can envision it in your mind and your taste buds. Can’t you picture it? All the ethnic grocery stores in the Strip District (Stamoolis Bros. for grape leaves, Penn Macaroni for cheese and pasta, Sunseri, Jimmy and Nino for sandwiches,Reyna’s for Mexican, New Sambok Oriental Market or Lotus, Benkovitz or Wholey’s for fish, Prestogeorge for coffee or Mancini’s for bread, Enrico’s biscotti, the Middle Eastern one and lots more). You get the idea. 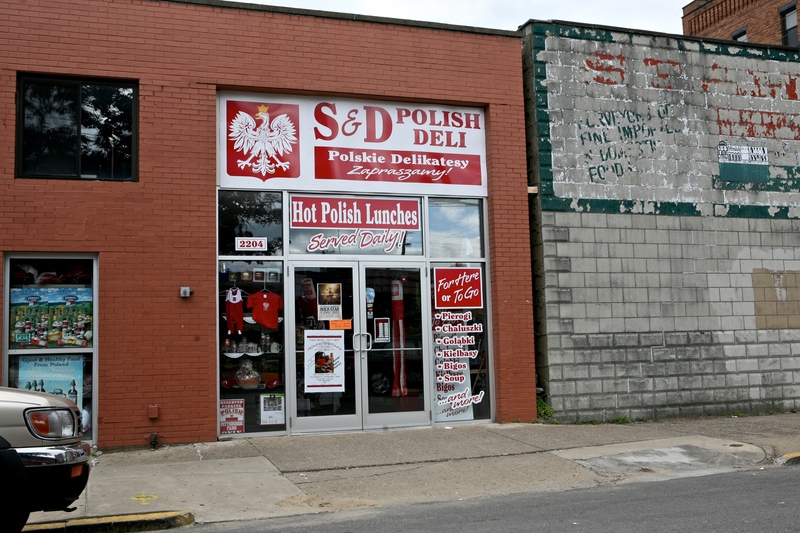 This afternoon it was the S and D Polish Deli where I was stopped at the red light. Click on their name to get the menu details. Ever eat Tripe Soup.? A recipe and video on the site of a woman making Golabki (stuffed cabbage) click here Around the corner is the Leaf and Bean (cigars and coffee) where Marc R plays gigs on Saturdays. Pittsburgh has it all! Yesterday a slideshow with people, today it’s buildings. Then I promise to lay off the slideshow option for a time. Must be the urge to be a filmmaker that seems to amplify the story with multiple images. I’ve driven by Zanesville for a few years and never pulled off the interstate. Today was the day. The town was deserted Sunday afternoon.When I was a kid the family stopped here enroute to Illinois, our annual trek. I recognized nothing although all these buildings would have been built then. See the “Y” Bridge on National Register of Historic Places where you cross the river and are on the same side of the river. A hobby shop. Lots of churches. One large building abandoned. Lots of rectangular church tops. I have noticed them as I drive by. And the Travelodge Motel. Muskingum County Courthouse is in the center of town. Check out the power lines right through the middle of town. Zanesville, Ohio. You set up a couple of chairs on the back porch. You bought a 4-pack of store brand cones, no nuts. You start shooting all four in the two chairs. You shoot fast and the antics begin. The dog licks drips. You try two at a time. Then singles. It happens without direction from grandma. Maybe Sunday morning when they’re dressed up for church you’ll try again. From the archives. I’m in Columbus and we just finished watching Crazy Heart with Jeff Bridges. Took this photo before I started posting. "Whoa, brother! 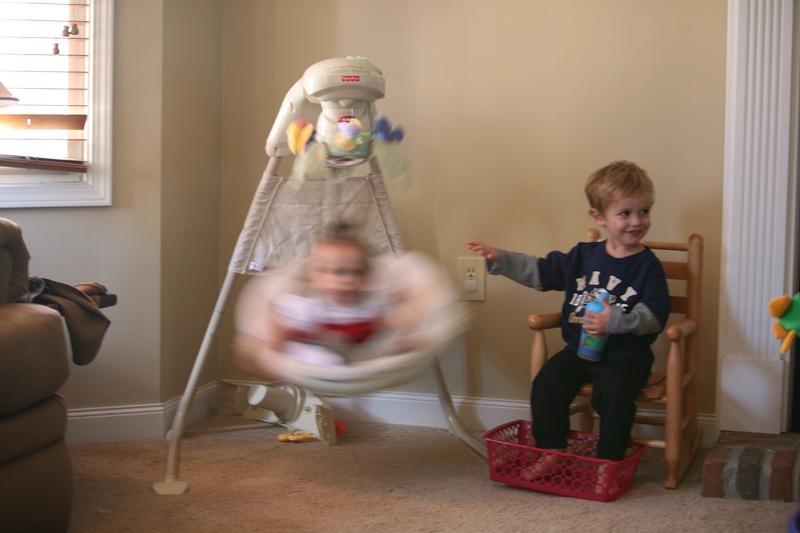 I'm getting dizzy" the swing was on automatic and needed no assistance!